This configuration is optional, but allows you to view in AsterSwitchboard the presence status of the extensions. In addition to the status you can set a message that the other extensions can read by positioning the mouse on the other image below the presence image. AsterSwitchboard attempts to automatically create the table for presence if the account specified in the settings for the MySQL database connection has sufficient privileges. 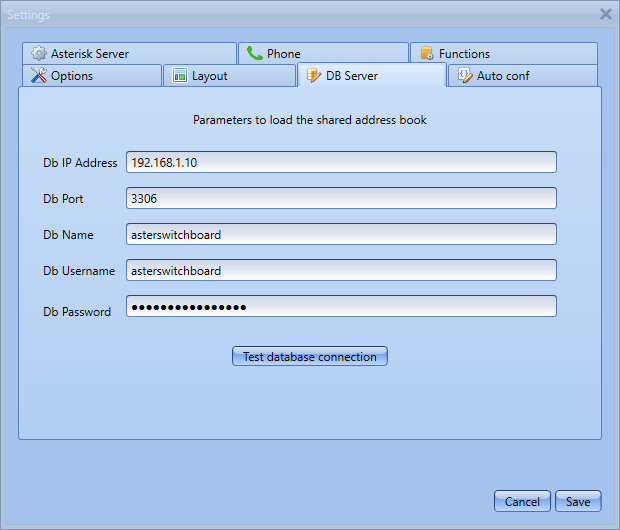 Once the database named 'asterswitchboard' with the table asb_presenza is created you can set the parameters so that the presence is available in AsterSwitchboard. From the "File" menu select "Settings" and then the tab "DB Server". They are the same parameters that are used to optionally configure the shared address book. You can check the correctness of the parameters entered by executing a connection test to the database via the button labeled "Test database connection". A message will confirm the results of the connection.